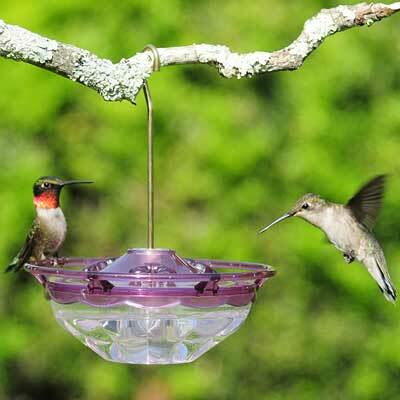 Bring wonderful style and color to your bird garden using the Aspects Plum HummBlossom Hummingbird Feeder. This adorable unit combines features of two of the most popular Aspects hummingbird feeders, the High View and HummZinger, for a truly remarkable unit. The clear, plastic base holds 4 ounces of nectar, and its softly scalloped design adds a decorative touch. A soft purple cap covers the reservoir, with three raised flowers creating feeding ports. Their three-dimensional design keeps rain from reaching the nectar, and Aspects Nectar Guard Tips (not included) can be added for protection against wasps and bees. A raised perch surrounds this cover, allowing the birds to rest and dine while offering you unobstructed views of their feeding activity. This plastic cap lifts easily to clean and refill the unit, while its size enables you to place several throughout your yard for a wealth of feeding spots. Attach the included brass rod to the integrated port for hanging this item from your favorite branch or hook. Enhance your garden with color and invite hummingbirds to the area with this Plum HummBlossom Hummingbird Feeder. Made in the USA. Lifetime guarantee.